It was said to protect you from sore throat and illness for the next year. The candles used had been blessed the day before on Candlemas. I used to suffer a lot from sore throats as a child until I went along one year and had my throat blessed. I didn’t suffer sore throats any of the years I had it blessed. I had a persistent sore throat this winter. Maybe this year it’s time to head for a blessing on 3rd February. 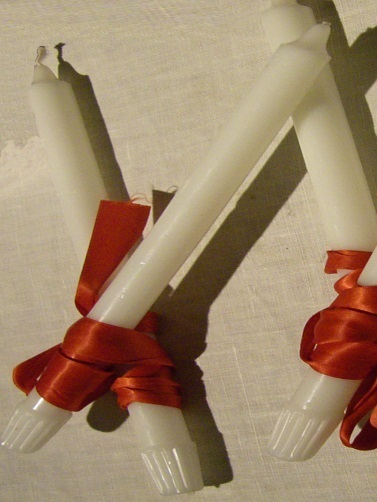 So who was St. Blaise? Blaise was a fourth century bishop at Sebastea (now the city of Sivas in central Turkey, in what was then the Roman province of Armenia-Cappadocia). He was martyred in about 316 during a time of persecution. In the Eastern churches his feast falls on the 11th February. 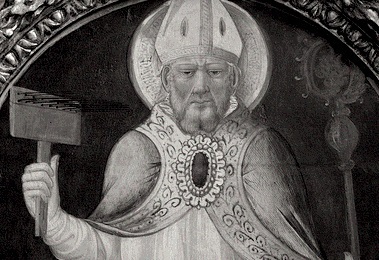 In accord with various traditions, St. Blaise was born to rich and noble parents, and received a Christian education. He was a physician before being consecrated a bishop at a young age. Some say that Blaise withdrew from the city of Sebastea and lived in a cave in the wilderness where he befriended the birds and wild animals. He cared for them and they watched out for him. So he becomes a forerunner of St Francis as patron of animals. It is said that he was arrested on orders of the local governor Agricolaus and on his way to prison, a woman whose pig had been carried off by a wolf begged him to help her. He promised with a smile that her request would be granted. Shortly afterwards the wolf appeared at the woman’s door depositing the pig at her feet. His death was certainly not pleasant. It is told that he was first beaten, then put on the stone table used for combing out wool and flayed with the prickly metal combs that remove tiny stones from the wool. Finally he was put to death and beheaded. Why is he widely regarded as the patron saint of sore throats? When Blaise had been captured and was on his way to prison, a boy was brought to him in danger of choking from a fishbone stuck in his throat. Blaise prayed over him and he was cured. His fame as a healer of sore throats is documented in the East from the 6th century and in the West by the 9th. But he also becomes a protector of cities, a protector of wild animals, a patron of veterinarians, wool-combers and of the woollen industry in general, as well a general benefactor or even a mascot of many rural and urban activities. Blaise’s popularity in England is linked with his patronage of the guild of wool-combers and there is a tradition that Blaise landed in person at Par Bay in Cornwall and taught the English the crafts of the woollen industry. The Church of St Blazey in Cornwall is named after him. In southeast France a great carnival took place on St Blaise’s Day. in the middle ages. The women would bring a pail of seeds to the church to be blessed. Then half the seed was taken home and mixed with the regular seed before plowing while the other half was left as an offering to the church. In Italy he is known as San Biagio.Throughout Italy and Sicily San Biagio’s Feast is celebrated where wool is worked. Slices of panettone or little cakes are baked on the 1st and blessed and shared out on the 3rd . In Serra San Bruno in Calabria, the biscuit for San Biagio is called an abbacolo (Latin baculus = walking stick, staff) and is baked in the form of a question mark or bishop’s crosier. The young men of the town offer them to their sweethearts. If the girl breaks the piece in two and gives part back to the boy, keeping the other for herself, it means she will marry him. In the year 971 Blaise, we’re told, appeared in a vision to alert the inhabitants of Dubrovnik, Croatia, to the danger of an impending attack by the Venetians. Ever since Dubrovnik has honoured him as it's city patron Sveti Vlaho and a statue of him holding a model of the city in his hand stands over the city’s entrance gate. Blaise’s emblems are wax, taper, wool-carding combs or two crossed candles; in art he is sometimes represented in a cave with animals. St. Blaise is also venerated as one of the "Fourteen Holy Helpers," a group of saints invoked as early as the 12th century in Germany and who are honoured on 8th August. The German Dominicans promoted this veneration, particularly at the Church of St. Blaise in Regensburg, where there is a fresco of him dating from about 1320.